Adriatic Gate Container Terminal (AGCT), a facility of International Container Terminal Services, Inc. (ICTSI) at the port of Rijeka in Croatia, has recently launched a rail service connecting AGCT with one of the country’s largest wood producers Cedar Ltd. to facilitate the export of beech wood products, informs ICTSI. The new intermodal service is arranged in partnership with the rail and road transport solutions provider AGIT, part of HZ Cargo Group, which transports the bulk of Cedar’s wood exports from their production facility in Vrbovsko to AGCT in the Rijeka port, therefrom the products are shipped to North Africa, Middle East, India and the Far East region. “The collaboration of Cedar, AGIT, and AGCT is a perfect example of how intermodal solutions are supporting the success of large scale production projects. We are very pleased that with increased share of intermodal transport at the Port of Rijeka, road traffic is reduced while more efficient and environmental friendly transport by railway and sea is increased,” said Wojciech Szymulewich, AGCT CEO. In 2012, Cedar Ltd. acquired an 180,000 sq.m. old saw mill in the west Croatian town of Vrbovsko. The town sits along the transit lines halfway between Zagreb and Rijeka with good road and rail access. Cedar’s Vrbovsko facility has become one of the largest and most modern beech wood manufacturing facilities in Europe. Recently the company has inaugurated an intermodal facility at the site linked directly with AGCT via rail. “Part of the project was to build an intermodal container yard on our land connected to the Vrbovsko rail tracks and purchase container handling equipment such as reach stackers and automated container stuffing machines. The new and direct intermodal link with AGCT via rail enables sustainable and cost-effective logistics,” said Darko Prodan, Director of Cedar Ltd. 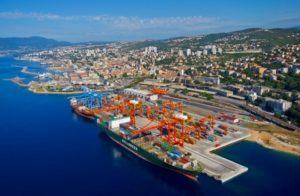 The Port of Rijeka marks an increase in container traffic due to the growing wood exports, with volume for the first 8 months in 2017 exceeding the overall volume in 2016. According to ICTSI’s consolidated financial results for the first 9 months of 2017, which the Philippines-based port operator has reported today, its revenue from port operations grew by 10% (USD 918.3 mln against USD 835.0 mln in 2016 y-o-y). EBITDA (USD 434.9 mln) was 11% higher than the USD 390.3 mln generated in the first 3 quarters of 2016. The total consolidated volume of 6,836,611 TEU is 6% more than the 6,435,192 TEU handled in the same period in 2016. Excluding the new terminals, the increase is 5%.